On our 3rd day we rode to a place in the sun called Lake Havasu City. The Colorado River flows south from Lake Mohave and runs about 50 miles from the David Dam to the Parker Dam between Laughlin and Bullhead City through Lake Havasu to Parker. It’s a boating waterway paradise with shore lined motels, condo’s and rental homes for miles and miles. Lake Havasu got its start as an Army Air Corp R&R camp during WWII and now has over 1000 businesses, 2 newspapers and a college. The first thing we noticed coming out of Laughlin was the wind really picked up overnight and we were seeing wind gusts of up to 30 MPH. Great riding when it’s behind you, but makes for a long day when you’re bucking that strong of gusts. 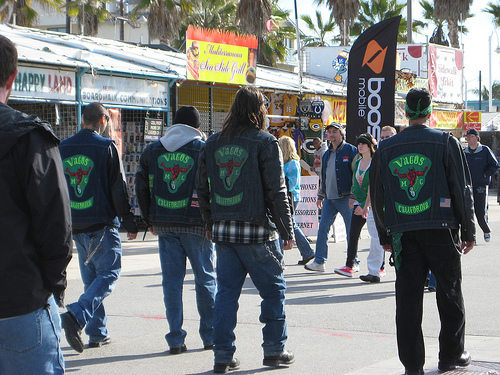 One of the posse met up with some OC buddies and did the “Sandbar”. 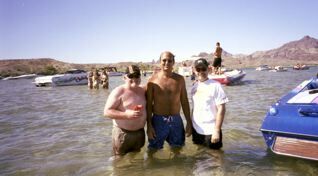 When it comes to a place on the water with post-college crazies the Lake Havasu sandbar has a head shaking, smile-making reputation. People head to the sandbar to tie up and party together and sometimes the masses get so massive you can walk from boat to boat without ever touching water. This is a photo (left) from a couple years ago, but not much changes except the size of the swimsuits! The larger group reached Lake Havasu in time for lunch and we enjoyed the scene on the lake as well as checked out the London Bridge. Yes, it’s THE London Bridge. In 1962, London Bridge was in a state of disrepair. Built in 1831, the bridge couldn’t handle the increasing traffic demands across the Thames River. The British government decided to put the bridge up for sale, and Robert McCulloch, Founder of Lake Havasu City, Arizona, and Chairman of McCulloch Oil Corporation, submitted the winning bid of $2.46M. The bridge was dismantled, and each stone was numbered. Everything was shipped to Long Beach, Ca., and then trucked to Lake Havasu City. Reconstruction started September 1968, with a ceremony including the Lord Mayor of London, who laid the cornerstone. On October 10, 1971, the bridge was dedicated. 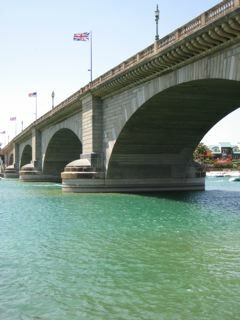 London Bridge crosses a narrow boating channel (Bridgewater Channel) that connects with Thompson Bay on the Arizona side of Lake Havasu. On the Google Map aerial view, the “A” mark is the London Bridge Resort, and just to the left is McCulloch Boulevard and the location of London Bridge. It’s a good bet that on any given day the Bridgewater Channel will be busy with people and boats filling the shoreline and when we got there it was no exception. There were large crowds of boaters with big block motors and women with inversely proportional swimsuits to the size of boat motors, all enjoying the blazing heat. We had lunch at Barley Brothers Grill (Island Mall & Brewery) and watched the boaters in the channel. We made our return trip to Laughlin via Needles fighting the wind the entire way. 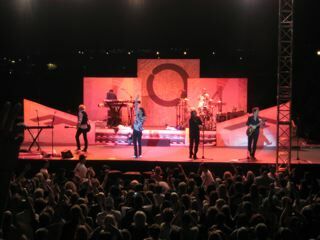 That night the headliner at the Aquarius (old Flamingo Hilton) was Foreigner. Led by British rocker Mick Jones they released the self-titled album in 1977. The album sold more than 5M copies with hits like “Cold as Ice”, “Feels Like The First Time”, and later with hits like “Jukebox Hero” and “Head Games”. Lou Gramm was the original lead singer of the band, but currently Kelly Hansen (formerly of Hurricane) is the lead showman. That 90 minute set at the Aquarius was most memorable.